Many are asking about Verizon cell phones for seniors. Verizon Wireless offers a wide range of phones starting from basic phones to the flagship smartphone devices. Unfortunately, Verizon doesn’t offer senior-friendly phones such as the famous Jitterbug phone, but if you’re looking for basic phones, Verizon has many flip phones that are easy-to-use for senior citizens. Here we’ll review the best Verizon phones for seniors including Verizon flip phones 2019 and Verizon smartphones for seniors. Verizon flip phones for seniors are manufactured by well-known brands such as LG, and Kyocera. From LG, Verizon Wireless offers the LG Exalt LTE. From Kyocera, Verizon Wireless offers the Kyocera Cadence LTE, Kyocera DuraXV LTE Non Camera, and Kyocera DuraXV LTE. From Sonim, Verizon Wireless offers the Sonim XP5. 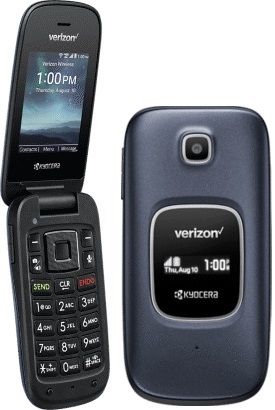 The Kyocera Cadence LTE is a flip phone with smarter features that comes with a 2.4-inch high-contrast display. The phone dedicated to an external display to show notifications. The keypad design and the simplified menu make this device an easy-to-use flip phone for seniors. You can access the internet at Verizon 4G LTE speed with the support of a quad-core processor. The flip phone comes with QVGA 2.4 high-contrast display. External screen to display notifications. Supports Verizon 4G LTE speed. HD voice quality with the dual-mic noise canceling technology. Hearing Aid Compatible (HAC) M4/T4. Supports up to 32GB external SD Card. The Kyocera Cadence LTE comes in blue and its retail price is $120, Verizon Wireless allows you to pay $5 per month for 24 months. That’s the best Verizon flip phone for seniors in the $120 budget, but if you can pay more money, we recommend the LG Exalt LTE as the best Verizon cell phone for seniors available right now. Check out the Verizon 65 plus plan for seniors. Check out the New Verizon 55+ plan for seniors. The LG Exalt LTE is a 4G LTE flip phone that comes with a 3.0-inch display. The phone dedicated to an external display to show notifications. The big buttons keypad and the simplified menu make this device an easy-to-use flip phone for seniors. This phone allows you access the internet at Verizon 4G LTE speeds. It supports HD Voice, loud and clear speaker, and has a text-to-speech reader. It also has a 5 MP camera with video capability. The flip phone comes with a big 3.0-inch display. Loudspeaker with HD voice quality. Supports text to speech feature. Built-in 5 MP camera with video capability. The LG Exalt LTE comes in gray and its retail price is $144, Verizon Wireless allows you to pay $6 per month for 24 months. 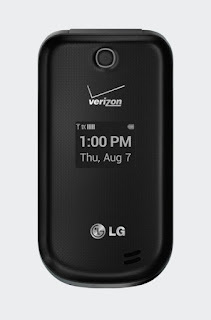 The LG Revere 3 is a basic phone compatible with Verizon, and comes with a 2.2-inch colored display, and dedicated to an external display to show the notifications. The keypad design and the simple menu make this phone an easy-to-use flip phone for seniors. The phone has a basic camera, supports hearing aid devices and Bluetooth so; you can use it hands-free. 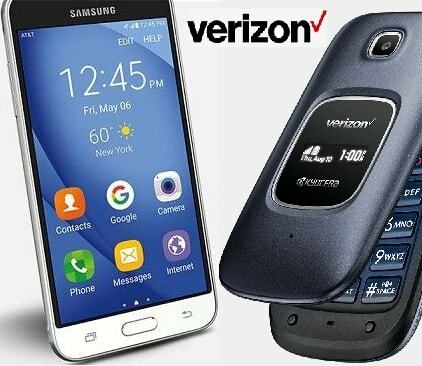 It also has a GPS and controllable audio system, all that makes it the best Verizon cell phone for seniors. Supports hands-free phone feature (Bluetooth). Long-life 950 mAh Li-Ion battery. Many are asking about Free Cell Phones for Seniors from Verizon, but at the time of writing the article, there are no offers from Verizon Wireless. Check out the free cell phones for seniors. Unfortunately, Verizon doesn’t offer especially-designed cell phones for seniors. But it offers many smartphones that can be used in the Easy Mode like Samsung Galaxy series and Apple iPhone models. If it’s hard for a senior citizen to deal the advanced smartphones available nowadays, it’s highly recommended to try a smartphone has an Easy Mode or go for a simplified smartphone for seniors such as the Jitterbug Smart, or the Doro 824 SmartEasy. As the cell phones offered by Verizon changed from time to another, we’ll update the list to focus on the best devices that can be Verizon cell phones for seniors.